Have you ever considered green tea weight loss? I have tried all types and colors of tea to lose weight and lately I started drinking green tea regularly because I like how it tastes. While testing if Green tea good for weight loss, I am also hoping to get some of the health benefits that are associated with consuming green tea regularly. Green tea is an excellent antioxidant that helps in fighting free radicals, heart disease, cancer and other health issues. Lately, scientists came to prove that why is green tea healthy and how it helps in fighting fat. What Substance in Green Tea Helps for Weight Loss? The substance that may promote weight loss by stimulating human body for more calories to burn and decrease fat accumulation is called catechins. Green tea contains the catechins substance in higher levels than black tea and oolong tea. Catechins is a type of polyphenols that is found in green tea. Beside the anti-inflammatory and anticancer properties, catechins can also decrease body fat accumulation and lower cholesterol levels in blood. Why Green Tea for Weight Loss? Green tea comes from the same plant that black tea and oolong tea come from. Yet, green tea leaves are not fermented before processing the tea. All types of tea contain polyphenols at different levels. Polyphenols are plant based substances that have anticancer, antioxidant, and antiviral properties. Any Scientific Proof to Back up the Green Tea for Weight Loss Claim? A study that was conducted on 35 Japanese men proved that taking 690 mg of catechins daily in the form of green tea extract helped individuals lose 5.5 lbs in average within 3 months of being on controlled intake of calories and fat. Green tea contains the fluorine substance which can help in preventing cavity and strengthen enamel in children’s teeth. Green tea can also help in Diarrhea because of the antioxidant properties that it contains. Green tea can help fight bacteria formation into the digestive system and sterilize intestinal tract. Green tea is rich with vitamin B, C, and E which are important to strengthen immune system, improve heart health and circulatory system. Hence green tea can serve as an excellent agent to keep infections at bay. Even though American Dietetic Association confirms that green tea is safe for children, it is important to limit their intake to ½ cup of green tea .Check with a physician before including green tea into a child’s regular diet. To maximize health benefits, it is recommended to take 4 cups of brewed green tea daily. You can get the same health benefits if you took your tea hot or cold, timing is important though. Green can help boost your metabolism and drinking green tea with your meals can aid in food digestion and processing. Try to drink your tea during the day rather than night time. Green tea has caffeine in it that might make it difficult to sleep at night. Green tea can serve as appetite suppressor and can help in controlling sugar craving. It can also help in lowering LDL- bad cholesterol levels in the blood. 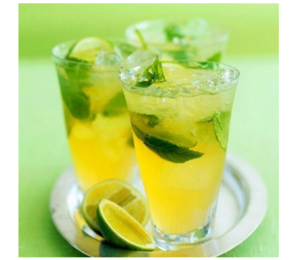 Green tea has anti-inflammatory properties which makes it a good drink to control inflamed joints and arthritis.